Within the extensive Apollo/lion coinage of Miletus, issued in silver and bronze from the fourth to the first century BC, the late wreathed bronzes or stephanephoroi (“wreath-bearers”) form an easily recognized group. When the Roman general Flaminius defeated Philip V of Macedon at Cornith in 196 BC he declared the mainland Greeks free from threat of invasion, and in consequence of this (it has been said, although the facts are not firmly established) the mint at Athens soon began a revival of the classic Athenian tetradrachm of the fifth century in a new style with a wreath of victory encircling the reverse owl. The stylistic element of the encircling reverse wreath, “as used on the New Style tetradrachms [of Athens], became a popular accessory to the designs of many Greek coins in the early second century” (Carradice, 1995: 76–77), appearing on the tetradrachms of Chalcis, Eretria, Myrina, Tenedos, and other cities, as well as on the second-century bronzes of Miletus. (1a) Stephanephoroi. 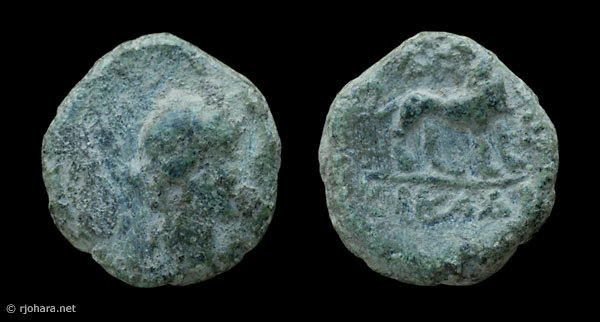 The term στεφανηφόρος is attested at Athens for the New Style tetradrachms, and its use is presumed, though not established, for similar coins elsewhere. It should not be confused with the title Stephanephoros, “applied to certain higher magistrates in some Greek cities because they had been granted the honour of being allowed to wear a wreath or garland on public occasions” (Melville Jones, 1986: 218). (1b) The rare “Roma” bronzes. 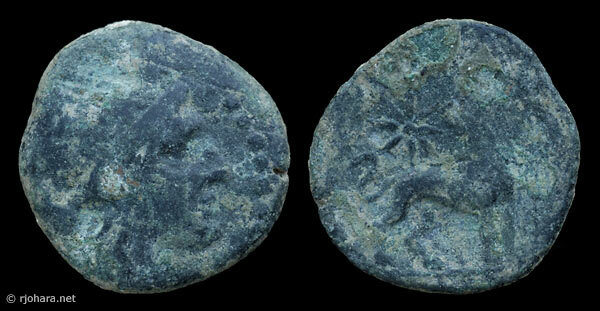 Seven bronze coins are known which feature a small helmeted female head within a ring of dots on the obverse, and a Milesian lion statant regardant to right within a laurel wreath on the reverse. Four of the seven specimens, all from the same obverse die, are illustrated by Deppert-Lippitz (1984: #934–940, pl. 30). Kinns (1986: 260) regards “D-L’s suggestion (p. 117) that this issue reflects the introduction of the Roma cult c. 130 BC [as] surely arbitrary. A prior question must be whether these are actually coins of Miletus at all, or of some other as yet unidentified mint.” No examples of this rare type are included in this collection. These are the principal bronze issues of Deppert-Lippitz’s Period VI (1984: #766–933). They include a common large denomination and a rare small denomination (known from only fourteen specimens). The large denomination is distinguished by the presence of a dotted border around the obverse Apollo and a laurel wreath around reverse lion, hence the common name “wreathed bronzes” for these issues. The decorative borders are absent on the smaller denomination. A variety of magistrates’ names are attested for each denomination, as noted below. This is the larger and more common of the two denominations (Deppert-Lippitz, 1984: #766–924), with specimens recorded that feature the names ΑΠΟΛΛΩΝΙΟΣ, ΑΡΤΕΜΙΔΩΡΟΣ, ΑΡΤΕΜΩΝ, ΒΙΑΡΗΣ, ΒΙΩΝ, ΔΗΜΗΤΡΙΟΣ, ΔΙΟΝΥΣΙΟΣ, ΔΙΟΦΑΝΤ, ΖΩΠΥΡΙΩ(? ), ΘΕΟΔΩΡΟΣ, ΙΑΤΡΟΚΛΗΣ, ΙΠΠΟΛΟΧΟΣ, [Κ]ΑΥΜΕΝΟΣ, ΝΙΚΟΜΑΧΟΣ, ΣΙΜΟΣ, ΤΙΜΕΑΣ, and ΧΑΡΙΔΗΜΟΣ. Kinns (1986: 241) adds the name [Η]ΓΗΣΙΜΑΧΟΣ. RJO 5. 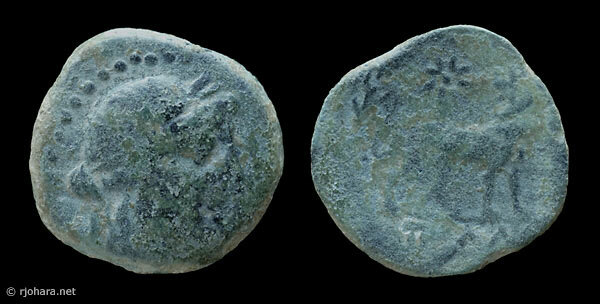 Bronze 17 × 18 mm (3.03 g, ↑↑), about 175–86/5 BC. 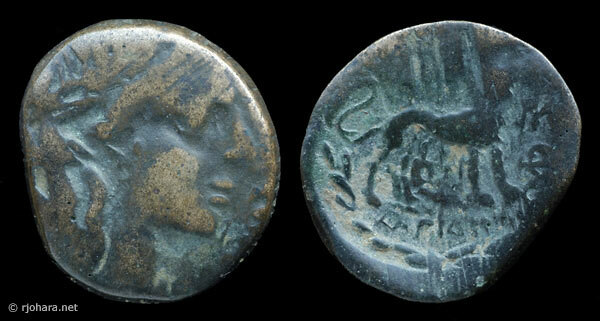 Obverse: head of Apollo right, within border of pellets. Reverse: lion standing right, looking back at ten-pointed sun (laureate border not visible); expected monogram and magistrate name are off the flan. RJO 10. Bronze 11 × 17 mm (3.68 g, ↑↑), about 175–86/5 BC. Obverse: head of Apollo right, within border of pellets. Reverse: lion standing right, looking back at eight-pointed sun (laureate border not visible); ΜΙ monogram to right of lion barely visible under magnification; second monogram below ΜΙ may be the Φ monogram seen on Deppert-Lippitz’s #813, #815, #830, and others, but it is barely visible. RJO 25. Bronze 16 × 18 mm (4.42 g, ↑↑), about 175–86/5 BC. Obverse: head of Apollo right, within border of pellets (barely visible at lower right). Reverse: lion standing right within laureate border, looking back at sun (barely visible), all within laureate border; ΜΙ monogram over Σ monogram to right of lion; inscription in exergue ΧΑΡΙΔΗΜ[ΟΣ]. Compare Deppert-Lippitz (1984: #869–870, #872), the only specimens she describes with this combination of magistrate and monogram. RJO 41. 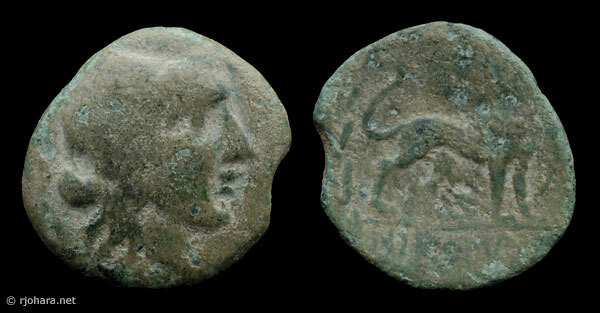 Bronze 18 × 20 mm (4.39 g, ↑↑), about 175–86/5 BC. Obverse: head of Apollo right, within border of pellets (barely visible at lower left). Reverse: lion standing right within laureate border, looking back at sun (off the flan); inscription in exergue ΝΙΚΟΜΑ[ΧΟΣ]. Compare Deppert-Lippitz (1984: #855), the only specimen she describes naming this magistrate. RJO 51. Bronze 17 × 16 mm (3.69 g, ↑↑), about 175–86/5 BC. 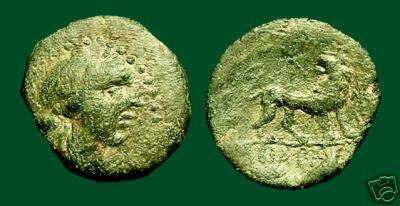 Obverse: head of Apollo right, within border of pellets. Reverse: lion standing right within laureate border (barely visible at left), looking back at eight-pointed sun; inscription in exergue [Α]Π[Ο]ΛΛ[ΩΝΙΟΣ]. Compare Deppert-Lippitz (1984: #766–768), the only specimens she describes naming this magistrate. RJO 97. Bronze 18 × 17 mm (4.49 g, ↑↑), about 175–86/5 BC. Obverse: head of Apollo right, within border of pellets. Reverse: lion standing right within laureate border, looking back at eight-pointed sun; ΜΙ monogram over ΦΛ monogram to right; inscription in exergue not legible. Deppert-Lippitz records the ΦΛ monogram on coins naming ΔΙΟΦΑΝΤ, ΙΑΤΡΟΚΛΗΣ, and ΣΙΜΟΣ (1984: #813, #815, #830, #856–858, #862), as well as on several where the magistrate’s name is not legible (1984: #877, #902, #908, #923). RJO 108. 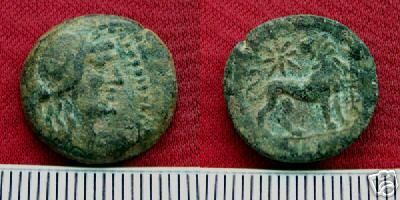 Bronze 17 × 16 mm (3.33 g, ↑↑), about 175–86/5 BC. Obverse: head of Apollo right, within border of pellets. Reverse: lion standing right within laureate border (barely visible on left margin), looking back at sun (almost completely worn away); ΜΙ monogram to right; inscription in exergue ΒΙΑΡΗ[Σ]. Compare Deppert-Lippitz (1984: #780–788), the only specimens she describes naming this magistrate. RJO 52. Bronze 12 × 11 mm (1.44 g, ↑↑), about 175–86/5 BC. Obverse: head of Apollo right. 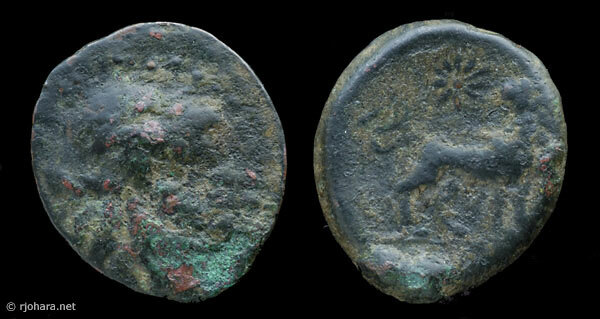 Reverse: lion standing right, looking back at sun (mostly off the flan); inscription in exergue [Ε]ΙΚΑΔΙ. No specimens naming this magistrate are recorded by Deppert-Lippitz (1984); Kinns (1986: 242) records a single specimen from his own collection.